Omega UR Tonic is a Respiratory Support Formula based on a Traditional American Herbalist formula that is a specific Remedy for Lung Related Diseases. Omega UR Tonic is a Respiratory Support Formula based on a Traditional American Herbalist formula. 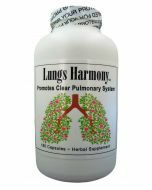 Assists the body in returning Respiratory Passages to Normal Functioning. Size Per Serving: 2.5ml two times daily. You can increase it to 5mls. after 14 days. Mullein is a Demulcent, an Emollient, Expectorant and Wound Healing. It is indicate for Chronic Otitis Media, Bronchitis, Respiratory Congestion and Influenza. Raspberry Leaf has strong Astringent properties. It soothes muscle tension and has a strong stimulating effect. It is Antispasmodic, dilating Blood Vessels and Tissues that are congested and stressed. Hyssop has a Sedative and Carminative effect on Tissues and Organs. It helps the body Sweat thus Detoxifying your body. In particular it is indicated for Nasopharyngeal Catarrh, Bronchitis and Fevers in children. Cayenne Pepper is an Antioxidant, Analgesic, Stimulant, Spasmolytic, Diaphoretic and Vasostimulant. It is indicated as an Appetite stimulant, Neuralgia and for Poor Peripheral Circulation. Other Ingredients: Hydronium Solution (H3O) as a preservative and to Potentize the Omega UR Tonic. No Artificial Chemicals or Colours. "About 6 years ago Willard Booth of Marion, AR. had an advanced case of emphysema and couldn't go anywhere without the aid of an oxygen bottle, he was given some of the "Omega UR" formula and on the second day he started spitting up tea leaf sized chunks of stuff from his lungs, he started taking it twice a day and in 4 months he was able to put the oxygen bottle away and returned to driving himself around without any aid to help him breathe ... "
" ... a little girl 18 months old had a sinus condition that made her nose to discharge constantly running down her upper lip, within 10 mins of giving her 1 tsp her sinuses cleared and her nose stopped running ... "
Her Wheezing from her Asthma of 27 years was gone. She could fill her Lungs with Air for the first time in years!" NOTE: For some people they could see results in a matter of weeks; whilst others depending on chronicity, it will take longer.